In Greek mythology, the Moirai – better known as the Fates – are the three goddesses who carry out a person’s destiny. 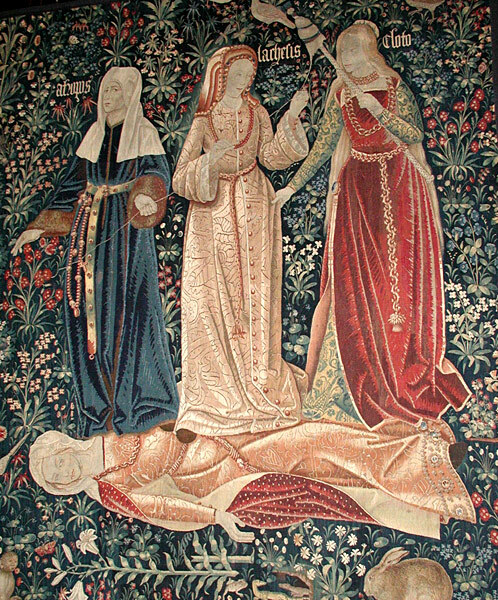 When someone is born, Clotho spins the thread of his or her life, while Lachesis measures the thread and Atropos it cuts with her shears when it is time for that person to die. The Moirai acted more or less independently of the other Greek gods to ensure that everyone’s eternal fate proceeded without obstruction. Even the gods had to submit to them — though some sources say that Zeus could interfere with someone’s fate when he really wanted to.